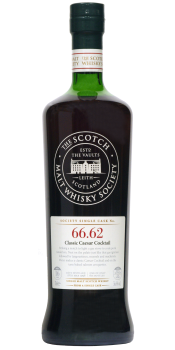 From a Refill Ex-Sherry Gorda cask comes 615 bottles called ‘Classic Caesar Cocktail’. It smells like moist hay with some notes of meet. Pork… Definitely pork! In the end some hints of sweet honey and dried dates appear. The taste is filled with sweet peat. It is absolutely amazing how Ardmore is working with their peat! Also some tannins and raisins come to mind, and the finish continues with the dried fruits and in the end just light peated sweetness. When it comes to peated whiskies outside Islay, I think that Ardmore is one of the best. And this is no exception! I will rate this 90/100 (23/23/22/22).